Cross-stream architecture, a design philosophy which erases all pre-conceived notions to create exciting new products. The new Four Winns V408 shows some of the most innovative design breakthroughs in decades. 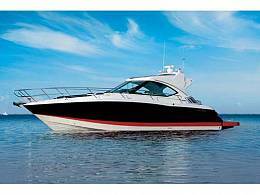 Debuting at the October 2008 Ft. Lauderdale boat show, the boat includes features that you will not find, collectively, on any other express cruiser - regardless of size or maker.